If you are hoping to buy a Lexington home this year or next, you might have heard that mortgage rates have increased in the past couple weeks. This wek, a 30-year fixed rate rose to 4.13 percent, the highest it has been this year. As a Lexington real estate agent, I want to explain that while historically low rates might be a thing of the past, buying a Lexington home is still a smart financial decision! Real estate experts predict that interest rates will continue to rise over the next four quarters. Therefore, the smartest time to buy in the Lexington real estate market would be now! It sounds like the sooner you buy, the more likely you’ll score a lower rate. If you think a fixed rate around 4 percent is too high, let’s take a stroll down memory lane. 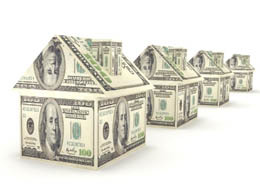 In the 2000’s, 30-year fixed rates averaged 6.29 percent. In the 1990’s, rates averaged 8.12 percent. In the 1980’s, rates averaged a whopping 12.7 percent! So while 4 percent is slightly higher than where rates have been sitting for the past couple years, they are still much lower than what other homeowners dealt with in past decades. 1. Mortgage payments are fixed. If you go with a fixed rate, you know what you’ll be paying as a monthly mortgage payment for the rest of your time as a homeowner. Average rent prices have increased 22.3 percent in the biggest 50 housing markets, and housing experts don’t predict that increase to end anytime soon! Rents will continue to go up, but mortgage payments are set in stone. 2. Home equity is financial resource for retirement. If you pay off your home in your working years, you’ll unburden yourself with a huge expense in your retirement years. Imagine living without rent or a mortgage payment! You might even have the option of a reverse mortgage, allowing you to live off the equity of your home while living in it. 3. A mortgage is like forced savings, with capital gains. When you rent, you throw that money away every month. You will never see it again. But with owning, you are investing in your future! Every month’s mortgage payment is like a forced savings account. Someday, you will sell your Lexington home, and most, all or more of that money will return to you! If you sell it for more than you bought it for, you don’t have to pay capital gains on that appreciation, unlike with stocks. As you can see, there are still many reasons to buy a Lexington home. Homeownership is still the smart financial decision! Don’t let higher mortgage rates scare you away. Contact me, your Lexington real estate agent, with questions or to begin your home-buying process in the Lexington real estate market.